BEIJING - When Ed Chan took over as Walmart China's president and chief executive officer in 2007, his mission was to keep the business growing in the emerging market, because the chain retailer had sold its outlets in South Korea and Germany the year before. In 2007, Walmart Inc, the world's largest chain retailer by sales and revenue, had more than 70 stores and 30,000 employees in China. "Since 2007, Walmart China has been maintaining double-digit growth, and now, four years later, we have more than 300 stores and 95,000 employees in the country," Chan told China Daily. Walmart entered China in 1996. "We have been growing with the Chinese retail industry over the past 15 years and we are very satisfied with our performance," Chan said. China is an important market in Walmart's global strategy, he said. According to Bloomberg News, retail sales revenue in China is expected to grow annually by 14.5 percent to $5 trillion in 2016. With a population of 1.3 billion, the country is experiencing fast urbanization, and the Chinese government is promoting domestic consumption to obtain sustainable development of the economy. Walmart said it will keep its focus on smaller cities in China. "So far, 80 percent of our Chinese stores are in second-, third- or even fourth-tier cities," Chan said. "I believe the lower-tier cities will see faster economic development than first-tier ones. So, Walmart China will increase its investment in lower-tier cities." The retailer plans to set up supermarkets and Sam's Clubs, a warehouse shopping service open to members, in lower-tier cities. Business in China currently contributes "less than 10 percent" to the company's performance outside its home market, the United States, according to Chan. But he said he is looking forward to the growing demand. Chan believes China is the world's fastest-growing major retail market and "may one day be the biggest". In mid-August, Walmart Inc released its second-quarter report. Net sales reached $108.6 billion, a 5.5 percent increase from $103.0 billion in the same period of last year. The net sales of Walmart International, the businesses outside the US market, increased by 16.2 percent to $30.1 billion, thanks in part to its mergers and acquisitions (M&As). In 2007, Walmart announced it had acquired a 35 percent stake in Trust-Mart Group, one of the biggest chain retailers in southern China, for $264 million. The US retailer also got a 30 percent additional voting right. In 2005, the most recent year for which figures are available, Walmart had about $1.3 billion in sales in China, trailing Trust-Mart, which had revenue of $1.7 billion, according to the China Chain Store and Franchise Association. The acquisition was aimed at further strengthening Walmart's presence in China by having Trust-Mart's national sales, distribution and purchasing networks. The acquisition also helped Taiwan-based Trust-Mart expand on the Chinese mainland. In 2009, it had more than 100 retail outlets in 34 cities on the mainland and employed more than 30,000 people. Its revenue amounted to 16.5 billion yuan ($2.58 billion) at the time. The acquisition is consistent with Walmart's strategy to explore international markets. With growth slowing in its home market, the world's top retailer is moving aggressively to capture market share in developing economies, including Brazil, India and China. According to Daily Finance.com, a US financial news service, net sales in 14 developing economies are expected to make up 26.1 percent of the world's retail industry. Walmart International has grown substantially, with its number of stores forecast to reach 4,557 this year, from 2,733 in 2007, an addition of around 360 stores a year. However, M&As are not always smooth. In 2010, the acquisition of the rest of Trust-Mart got delayed, a setback rumored to be the reason for the recent departures of several top executives. The US retailer said that it has appointed Sean Clarke as the new chief operating officer of its Chinese division. Clarke was previously head of finance for the company in Canada. It also named Steve Smith chief marketing officer for China. Smith was previously senior vice-president of strategy, marketing and communications with Delhaize Group. A number of executives have also left Walmart's Chinese operation recently - Rob Cissell, former chief financial officer, in May, and Shawn Gray former vice-president of Walmart China's hypermarket operation, in June. 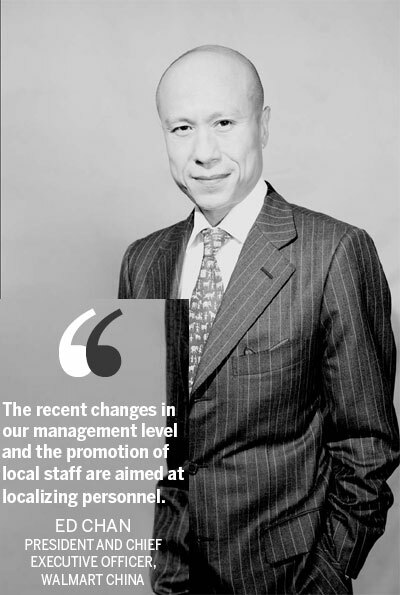 "The recent changes in our management level and the promotion of local staff are aimed at localizing personnel," said Chan. "And we are confident that the mix of Walmart global talents and strong local leaders will guide the company to further success in this booming market." Walmart said that as of Aug 5, it has been operating 346 supermarkets and six Sam's Clubs in 128 cities in China. Though it developed quickly in China, in recent years it has had to compete with increasingly sophisticated Chinese retail conglomerates such as China Resources Retail Group Co Ltd, Shanghai Brilliance Group and Lianhua Supermarkets Holding Co Ltd, as well as international counterparts such as France-based Carrefour Group, the UK's Tesco PLC and the German retailer Metro AG. According to Kantar Worldpanel, a British research firm, Taiwan-headquartered RT-Mart is the biggest retailer on the mainland, with a 6.3 percent market share in the year ending June 17. Foreign chains such as Walmart, Carrefour and Tesco have a smaller market share in China than RT-Mart. To become even more localized, Walmart is joining hands with e-commerce players in China and abroad in investing in the country's fast-growing online retail arena. Walmart reached an agreement with the Shanghai municipal government to establish an e-commerce office in the city to oversee Walmart's online retail operations in China. The retailer and the Shanghai government agreed to work together to train e-commerce personnel and speed the development of online retailing in China. "The scale of online sales in China is expanding rapidly and is projected to match US online sales in the next few years," said Wan Ling Martello, executive vice-president of global e-commerce for emerging markets at Walmart. "We are very optimistic about China's e-commerce market and its growth potential. With Shanghai as our global e-commerce China headquarters, we look forward to offering Chinese consumers a wider selection of quality products at good value and a great online shopping experience." According to the China Internet Network Information Center, the government-authorized body that maintains the country's Internet infrastructure, China had 161 million online shoppers by the end of last year. Forrester Research forecast that online sales will reach $159.4 billion by 2015, up from $48.8 billion in 2010. The announcement of the Shanghai office followed Walmart's recent announcement that it had purchased a minority stake in the Chinese online retailer Yihaodian. Chan said that Walmart China was also testing new marketing strategies, such as sending store information to customers by cell phone or using micro blogs. Chan attributed part of his success to his previous working experience. Before joining Walmart in 2006, he was the regional director of the Dairy Farm Group North Asia and director of Dairy Farm Management Services Ltd from 2001. Prior to that, he was CEO of the group's Wellcome Supermarket division in Taiwan. In his spare time, Chan often spends the weekend in Hong Kong and he cooks for his family, his wife of 24 years and three daughters. "Retail demands long working hours ... but what I did can be a positive influence on my daughters, because they have witnessed their dad's diligence and sense of responsibility," Chan said.